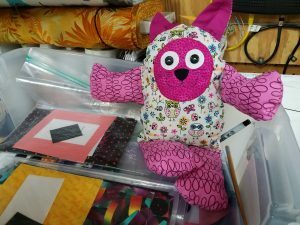 In July, I visited QuiltWorks, a wonderful quilt store in Bend, OR. 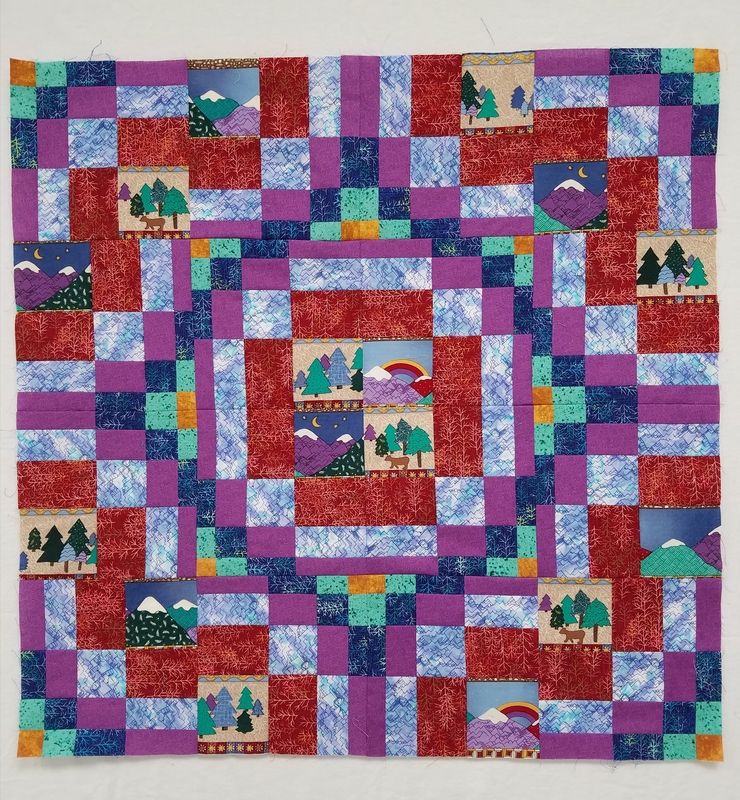 Marilyn Forestell, the quilt store owner, has founded a non-profit organization, Sew Teach Me. 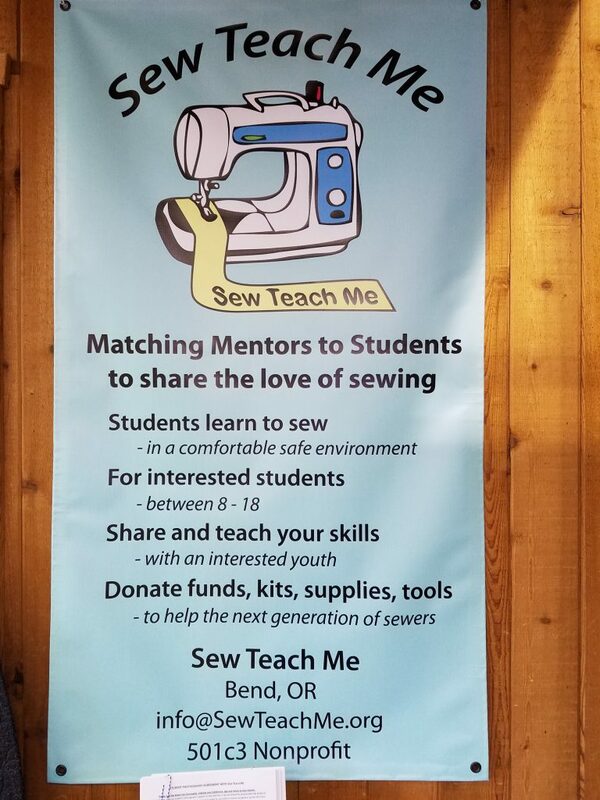 Their vision is to match trained and screened mentors with youth to learn to sew at no cost in a safe and nurturing environment supported by a community with the necessary tools, skills and projects for a successful sewing experience. 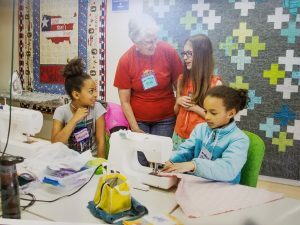 Marilyn’s team of volunteers teach youth basic sewing skills at her store and want to share their love of sewing with the next generation. 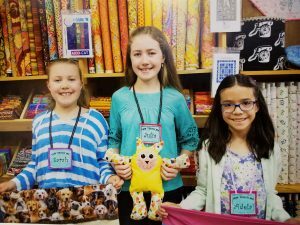 The Sew Teach Me website provides a wealth of information and the opportunity for you to set up your own team at your local store. 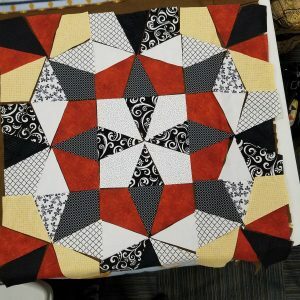 You will receive full guidelines for the projects to help you get started. 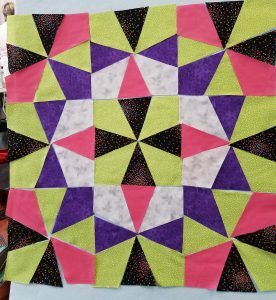 To learn about becoming more involved, you can also contact Marilyn at marilyn@quiltworks.com. 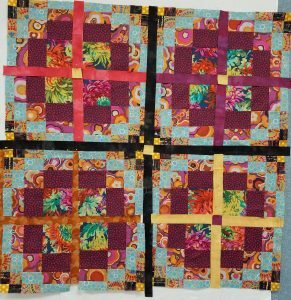 The four beginning sewing sessions teach basic sewing skills, while creating simple and fun projects, within a one to two-month time period. 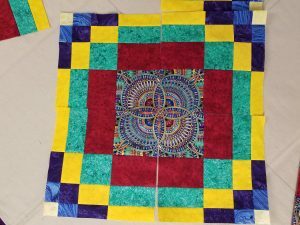 These classes are free. 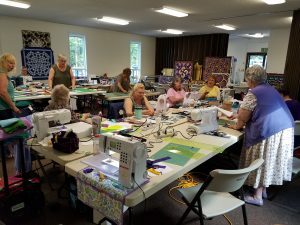 Materials, including sewing machines that have been donated by the local sewing community. The mentors are volunteers who have gone through a background check, and a training session to be prepared to work with students. 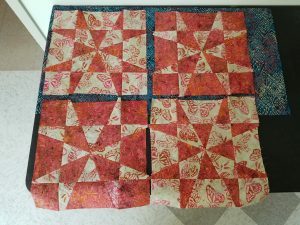 There are many donation opportunities from donating funds to helping build the program to donating pre-cut kits for the various projects. 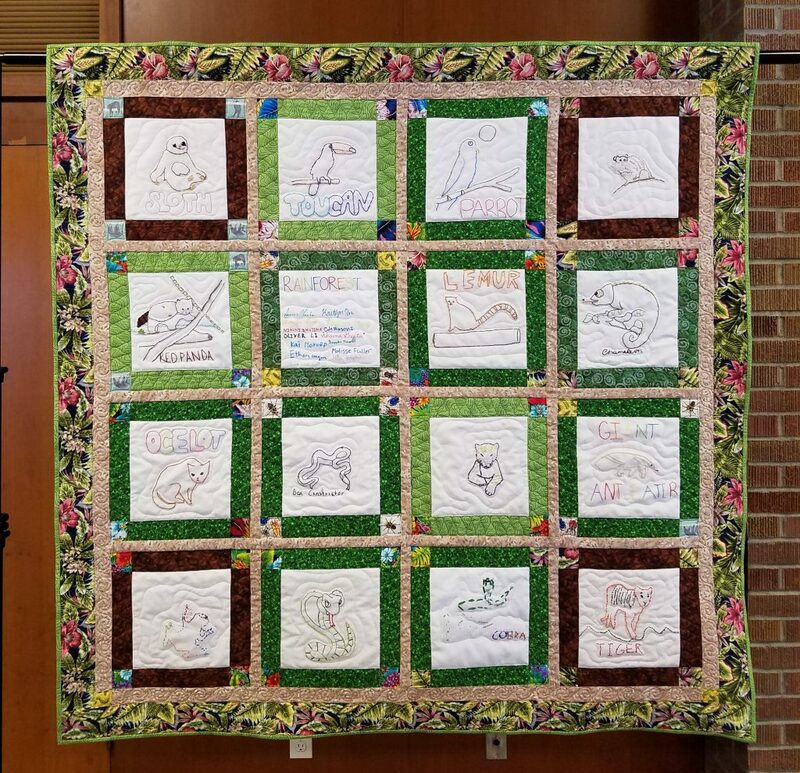 I applaud Marilyn for initiating this project which has already introduced over 100 youngsters to the joys of sewing. I encourage you to work with kids. 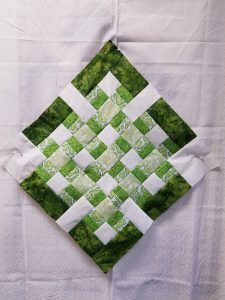 Even if you can’t develop a full program like this, you may have the opportunity to work one-on-one with an eager young person who wants to learn to sew. 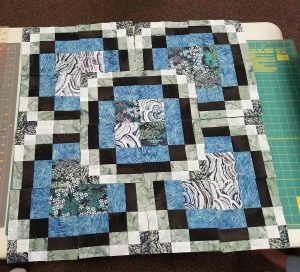 Start with a small project that may be easily completed, before moving on to larger more time consuming ones. 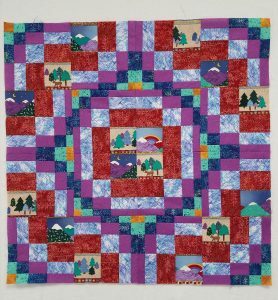 My books, Creative Quilting with Kids and Patchwork and Quilting with Kids have a wide range of projects for individuals and groups. The books are out-of-print, but second-hand copies are available on Amazon. 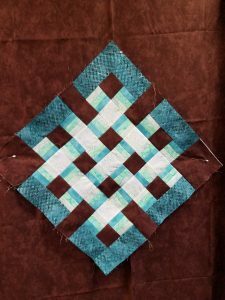 In July, I taught a two-day workshop for the Kenai Peninsula Quilters in Soldotna, AK.We did Bargello Quilts with a Twist making my 16-piece Bargello blocks and then designing with them. 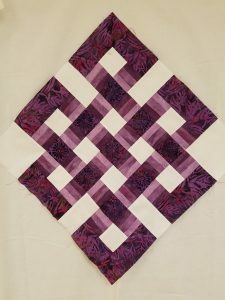 I love to teach this as a two-day class because students have enough time to complete a good number of blocks and reach the creative part of arranging them to generate many patterns. It was a big group with 18 students. 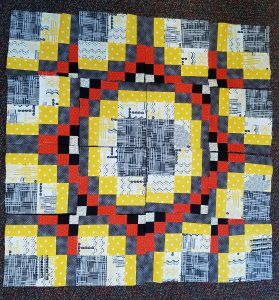 We had a wonderful time and they delighted in seeing the variety of blocks and layouts from all the different fabric choices. 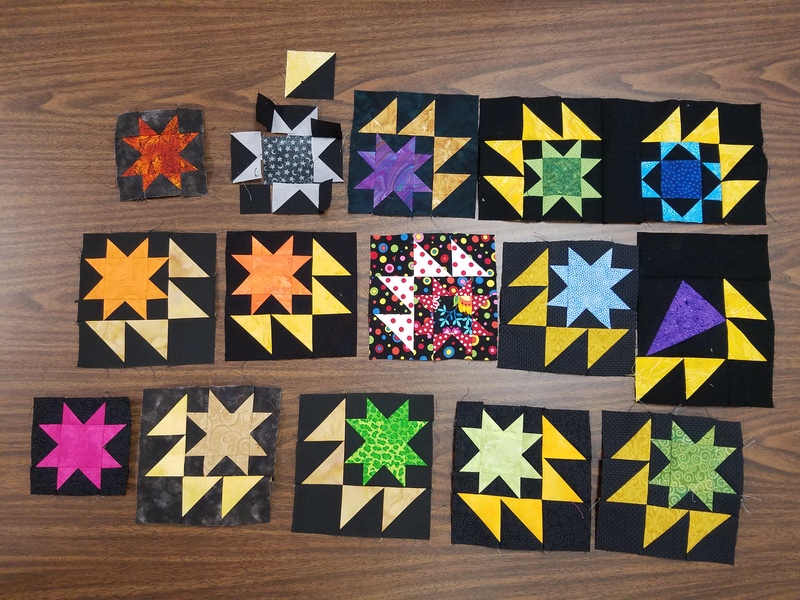 We began by making 16 blocks, but some students had time to make extras for a larger quilt. 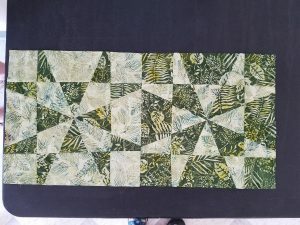 One lady even completed her quilt top of 24 blocks on-point with setting triangles. 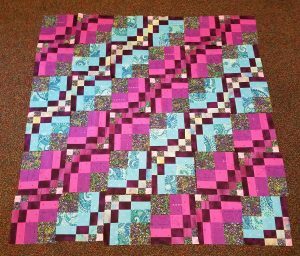 Here’s a selection to give you some idea of the many possibilities from working with this block. 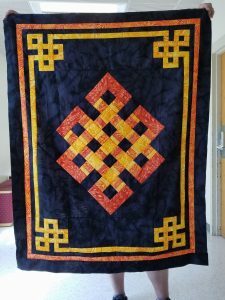 At the beginning of June, I was a faculty member for the North Carolina Quilt Symposium, hosted this year by the Asheville Quilters’ Guild in Asheville on the campus of the University of NC. 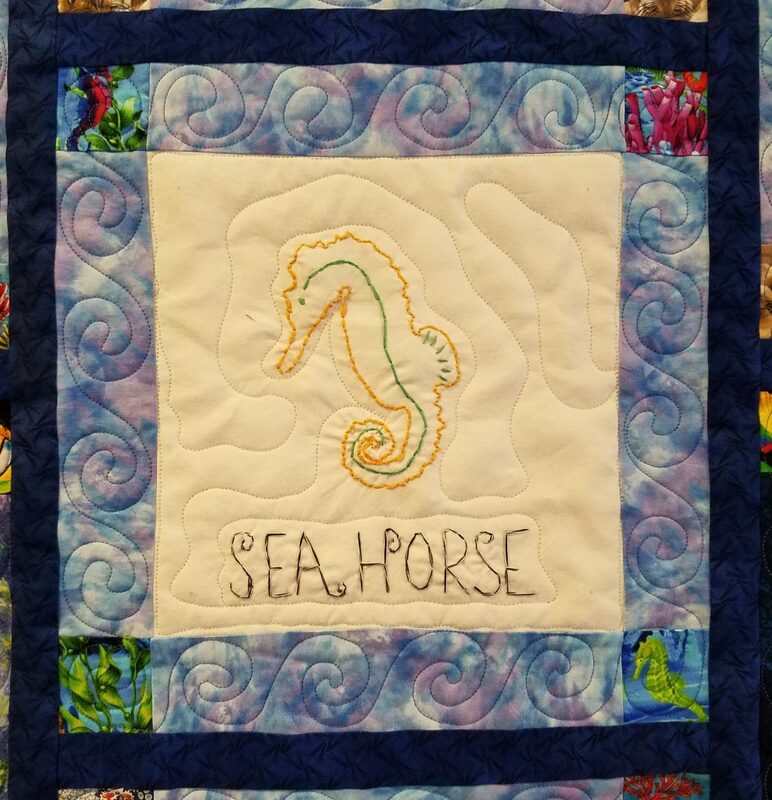 It was a wonderful four day event with 17 national teachers and 350 attendees. 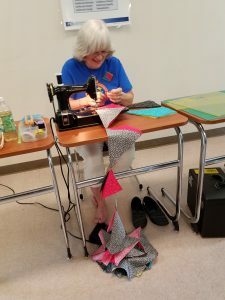 I taught two full-day workshops and one half day. 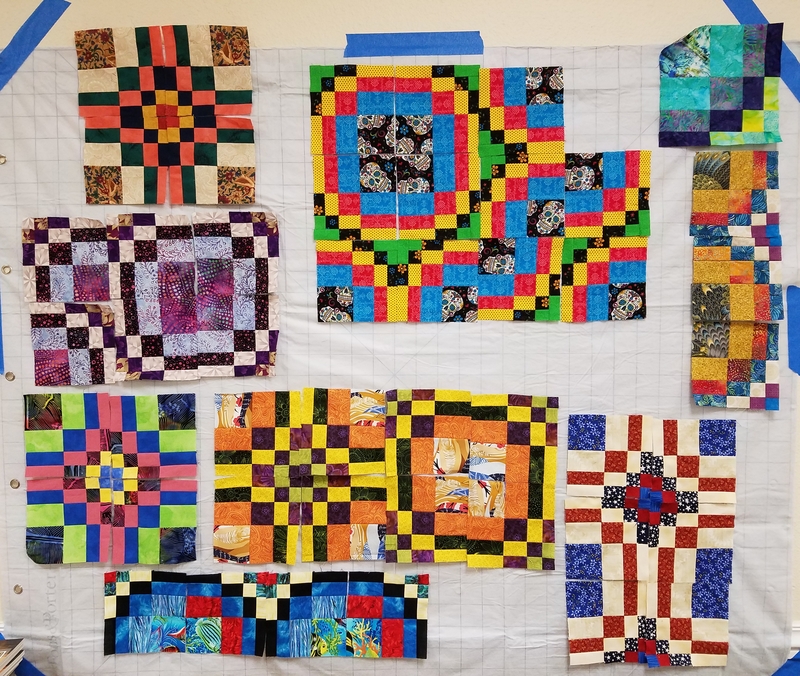 It’s always a joy to see my students’ work develop and there is such a variety of fabric choices making for very differing results. Here’s a sampling from my Op-Art Kaleidoscope class, where students made large Kaleidoscope blocks, cut them into nine pieces and rearranged the parts to create these new blocks. 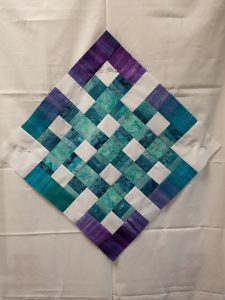 This technique works well for batik fabrics, as shown below. 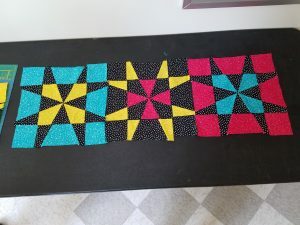 The multicolored scrambling of the block parts rather than only using two fabrics, made for an interesting variety of blocks. 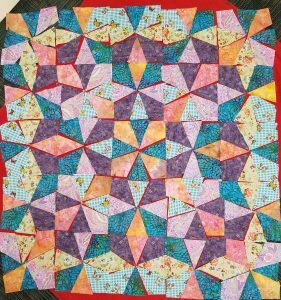 This student went to town on her assembly-line piecing and created quite the pile of kite and wedge pairs! 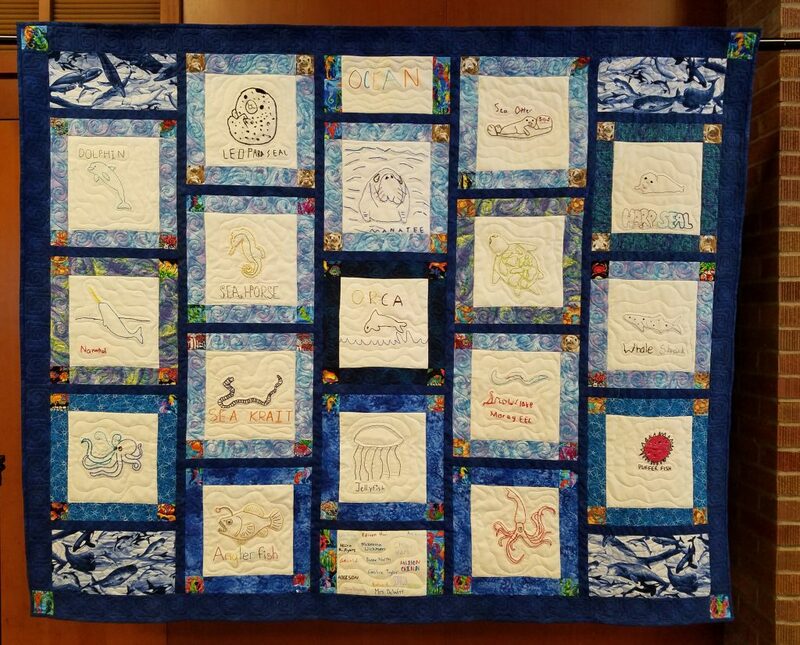 Another student from my other full-day class, the Gateway to Mongolia, worked in the dorm room to complete the whole quilt top which she brought to show me at the end of the symposium. 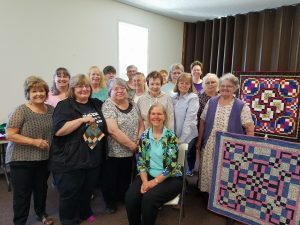 I love the enthusiasm of these ladies and thoroughly enjoyed my time there. 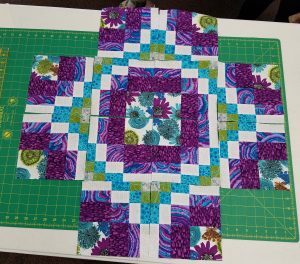 I recently taught my Gateway to Mongolia class at the Metropolitan Patchwork Society in Beaverton, OR. 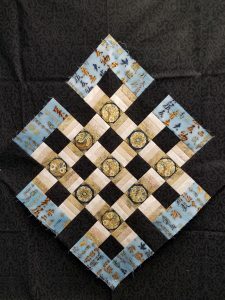 The pattern is available from my on-line store. 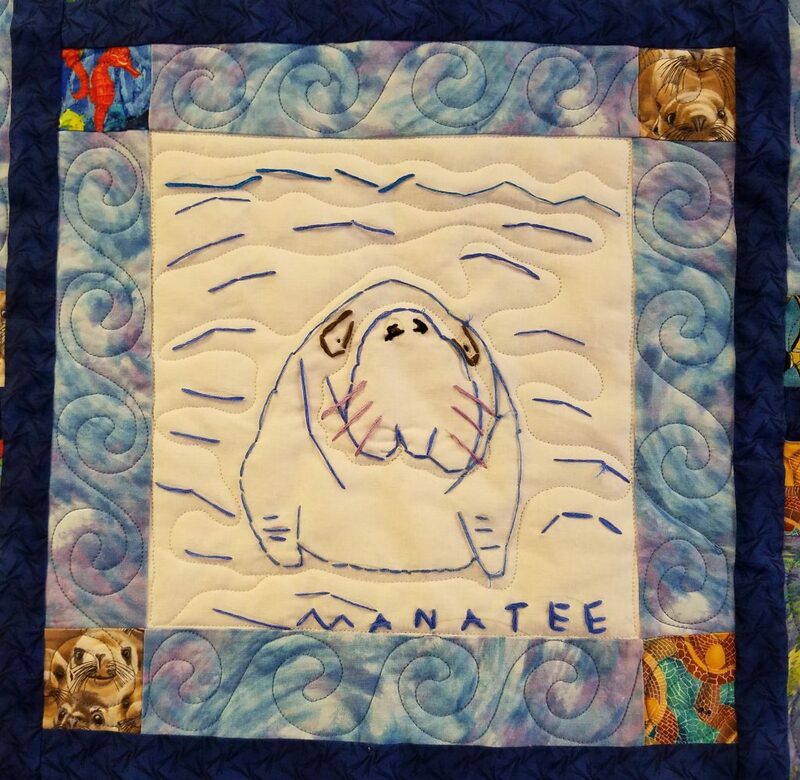 Here is what one of my students made. 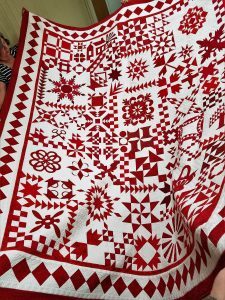 This beautiful Ölzii is made from one fabric. 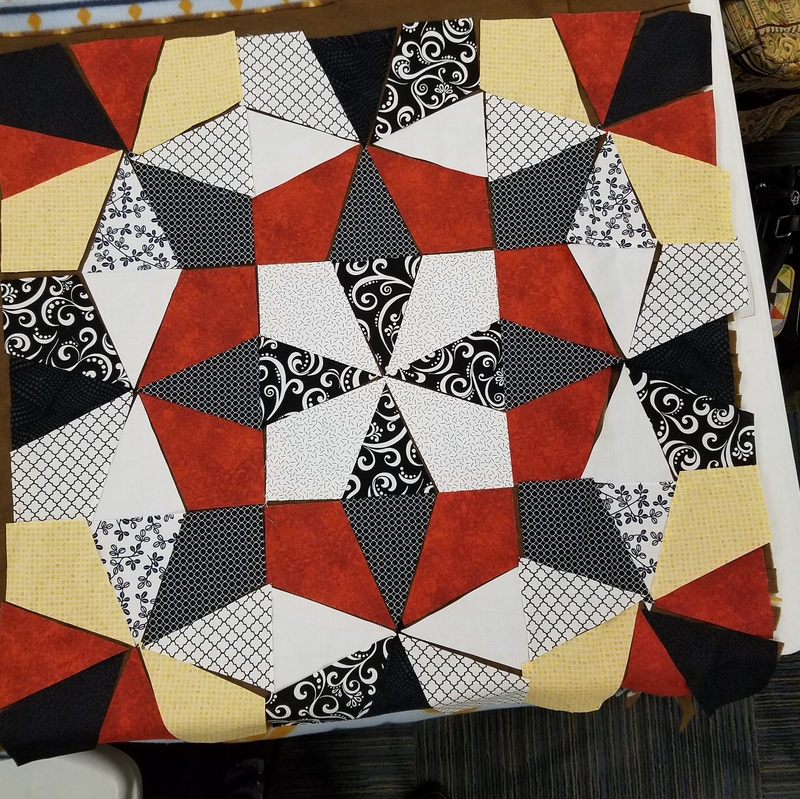 When I first saw the fabric choice that this student brought to class, I wasn’t sure how the fabrics would work together. 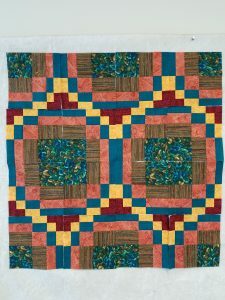 However, she was able to fussy-cut from selected areas of one fabric to create the desired effect and it is very successful. 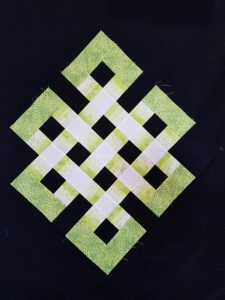 She used motifs in the pattern for the intersecting squares of the Ölzii design and sections of fabric that changed from lighter to darker green instead three different fabrics for a color gradation. 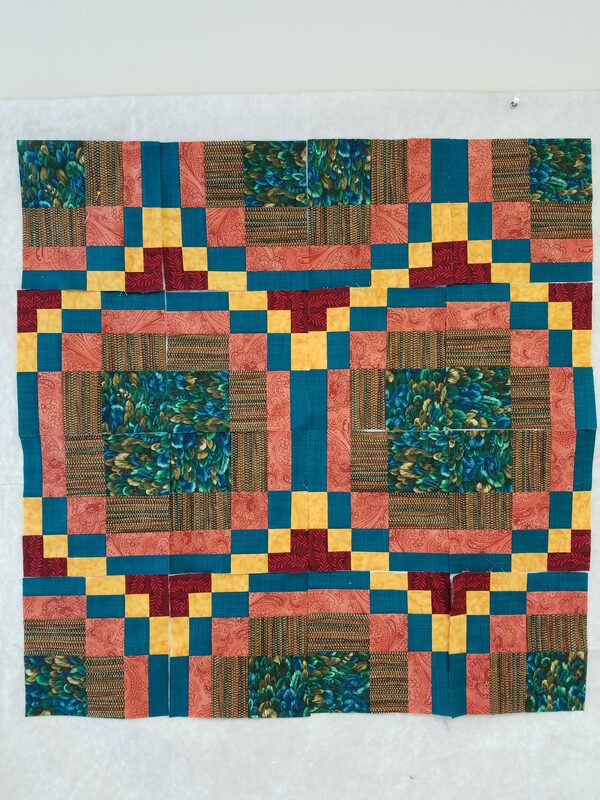 The fabric in the outer edges of the Ölzii also came from this fabric. 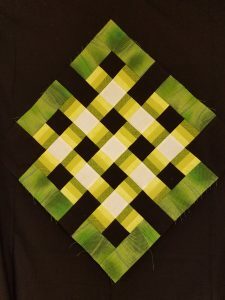 It really pops on the black background and we were delighted with the results. Here are another two, one on a light background and the other on a dark background. 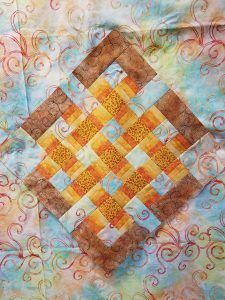 Both students did a fine job on achieving the woven effect with a good gradation of colors. In late April, I taught at the Cheyenne Heritage Quilters’ Guild in Cheyenne, WY. 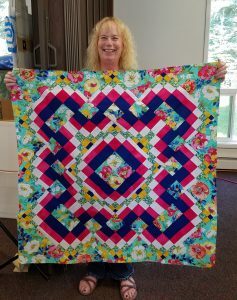 It was a large class of 19 ladies and each designed their own unique Kaleidoscope Puzzle quilt. It’s always fun to see the patterns emerging and the variety of fabrics that the students bring to class. 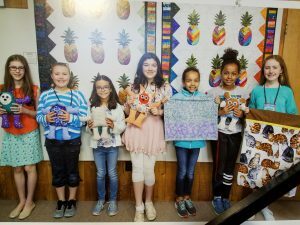 They learn a great deal by looking at the fabric combinations used by their fellow students and also the importance of choosing a variety of values, (contrast between the different fabrics), so that the patterns they create are easily visible. 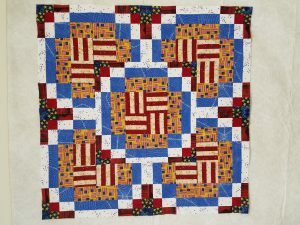 They could design squarely set or on-point quilts. 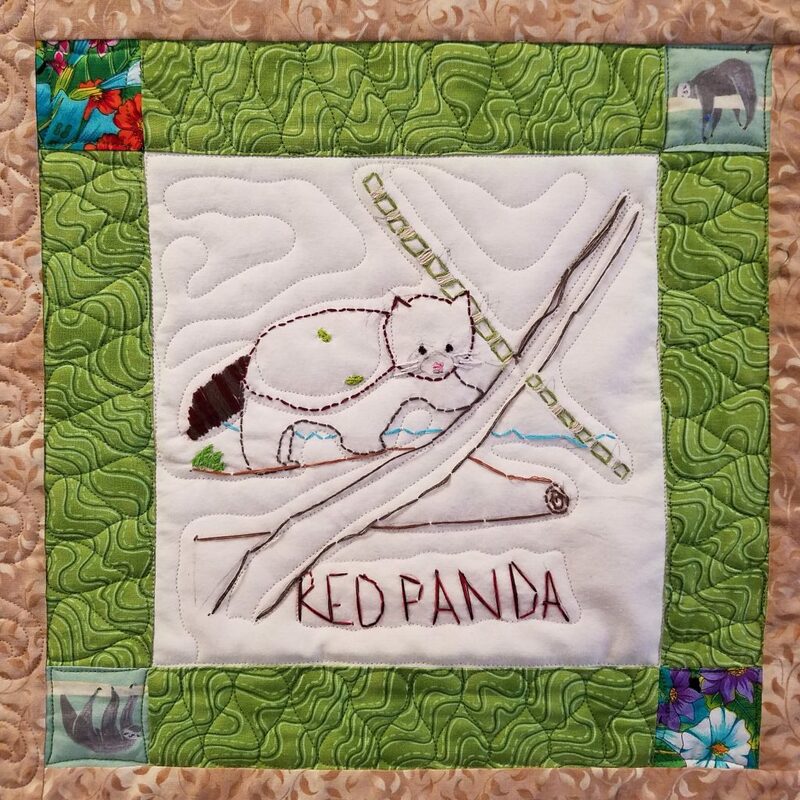 Here’s a sampling of their work. 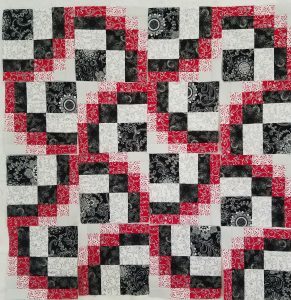 I spent two weeks in March teaching at four TX quilt guilds. 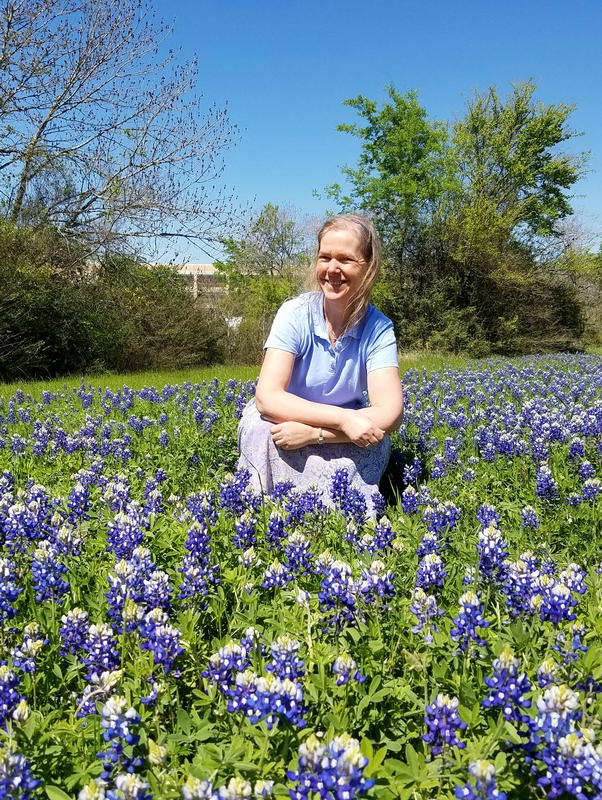 Spring was definitely springing in TX, where they had unusually warm weather in February, combined with enough rain to make for a bumper crop of gorgeous bluebonnets. 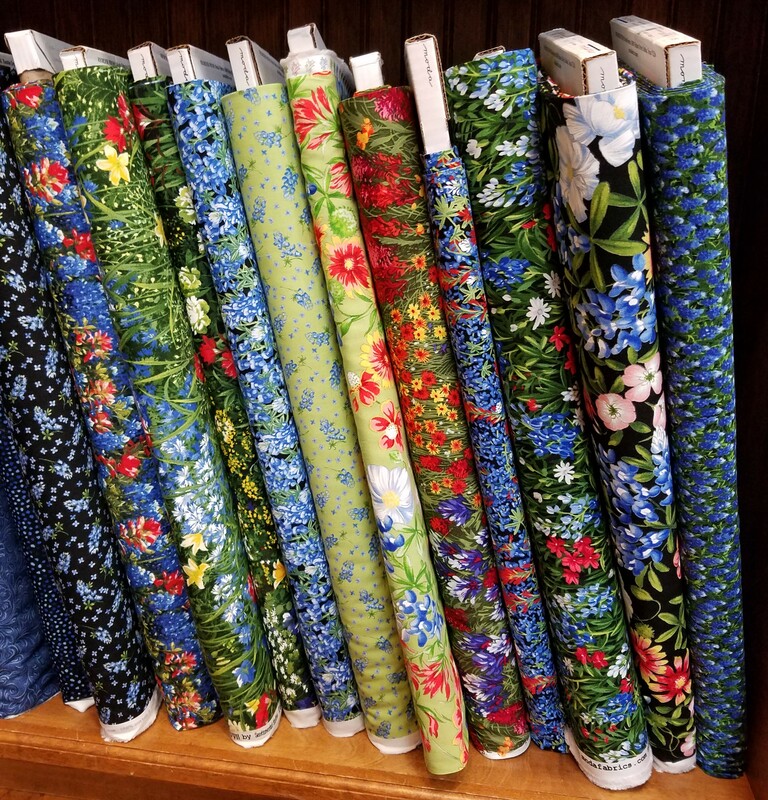 Here I am in Bryan, surrounded by these beauties. 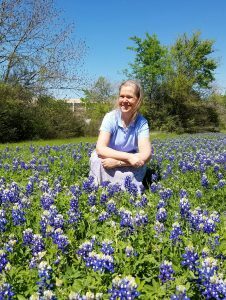 I loved the brilliant swaths of blue along the highways, then patches of rich orange Indian paintbrushes and areas of delicate pink primroses. 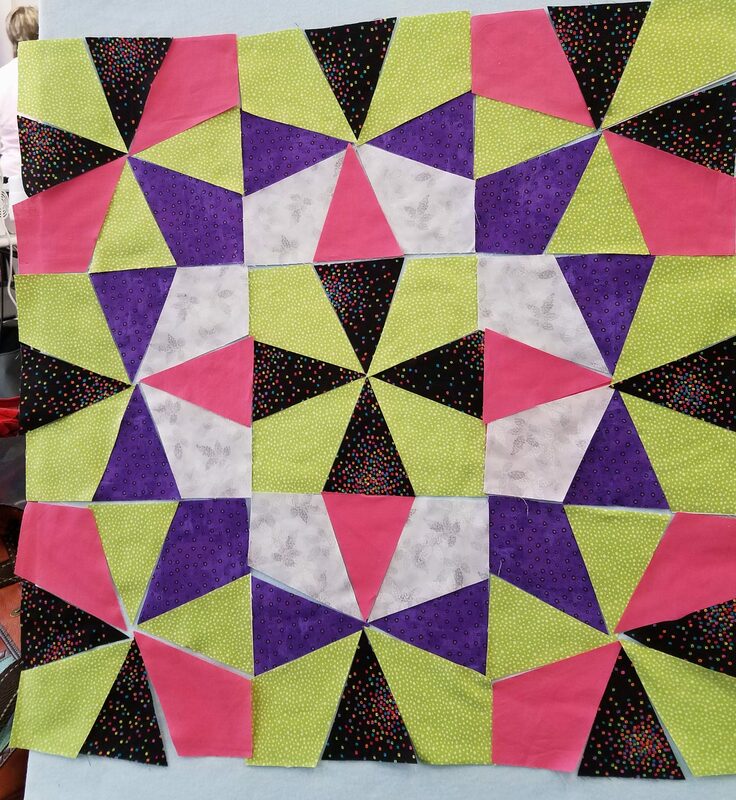 Of course, time with quilters always involves visiting the local quilt stores and I relished several on the trip. 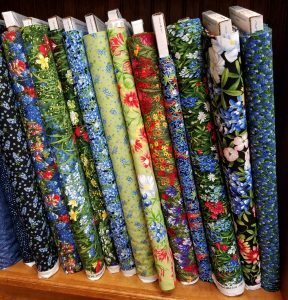 Here are some lovely TX wildflower fabrics sold in most of the stores there, (check at a later date for blogs on the TX stores). These are so appropriate for this area. 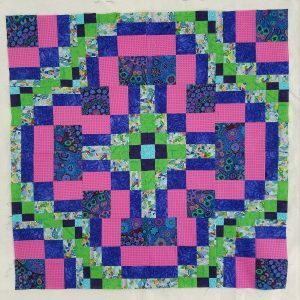 My first engagement was with the Greater San Antonio Quilters’ Guild. 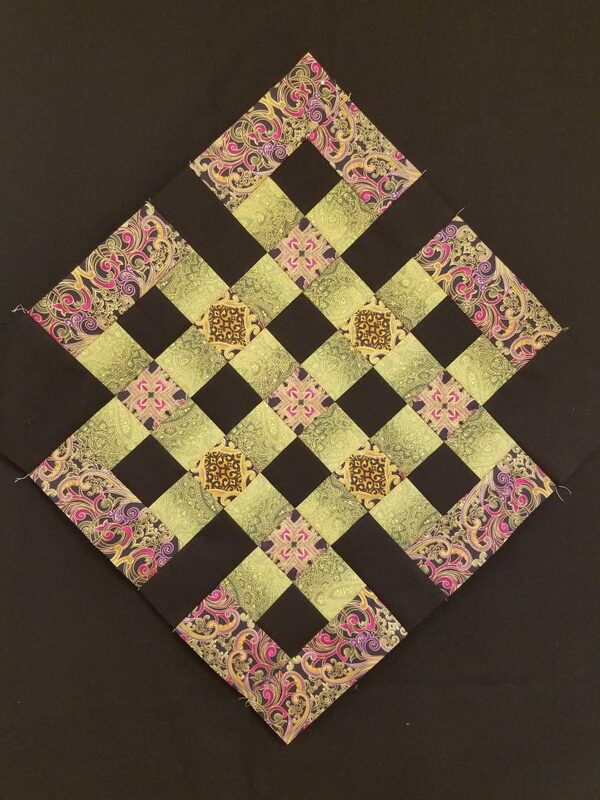 I taught my Op-Art Kaleidoscope workshop the day before the guild meeting. 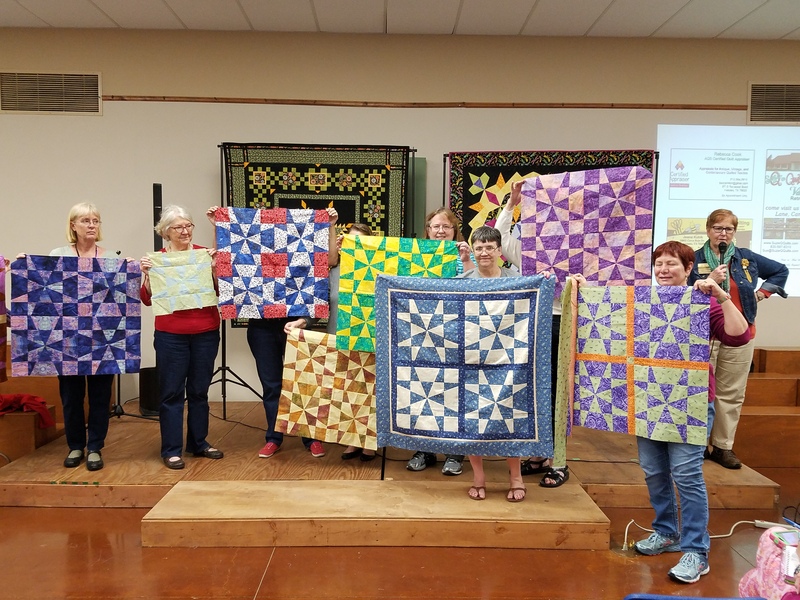 Several of my students continued piecing their blocks and quilt tops at home that evening, and here they are putting on a nice display during “Show and Tell” at the meeting. 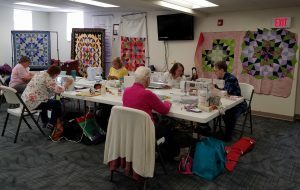 After the meeting, I did a half-day UFO class discussing quilt design and problem projects. 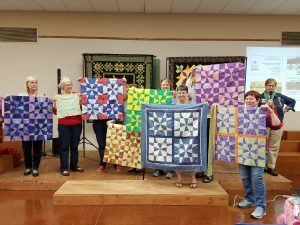 The next stop was the Brazos Bluebonnet Quilt Guild in Bryan where I taught my Bargello Quilts with a Twist class. 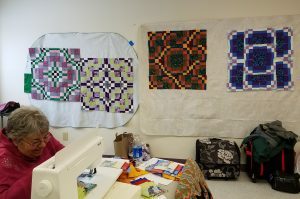 From there I transferred to the Vereins Quilt Guild in Fredericksburg and The Hill Country Quilt Guild in Kerrville. 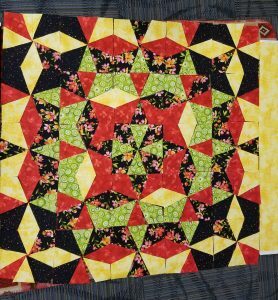 In Fredericksburg, my students worked on precision piecing of triangles to make Sawtooth Star Bear’s Paw blocks. 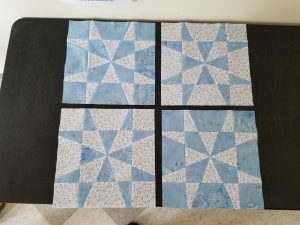 Here are some partially completed blocks. 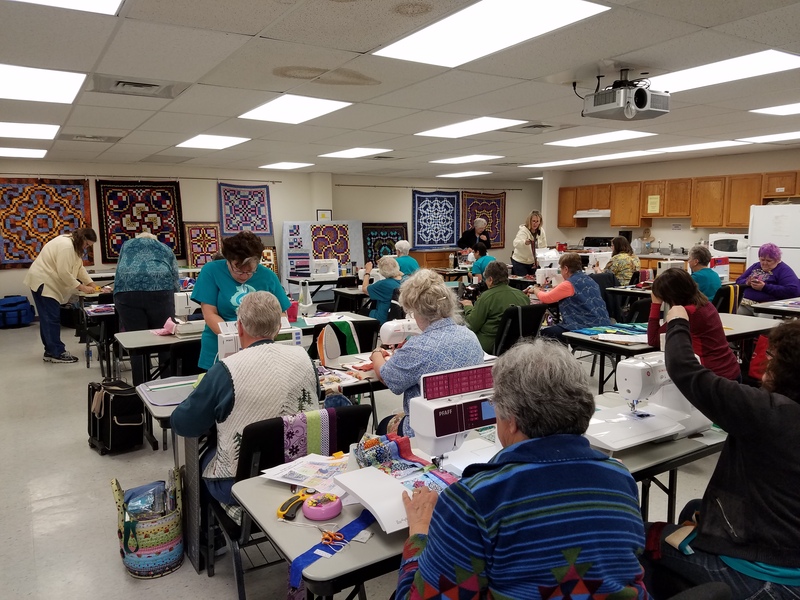 My final class in Kerrville was the Gateway to Mongolia. 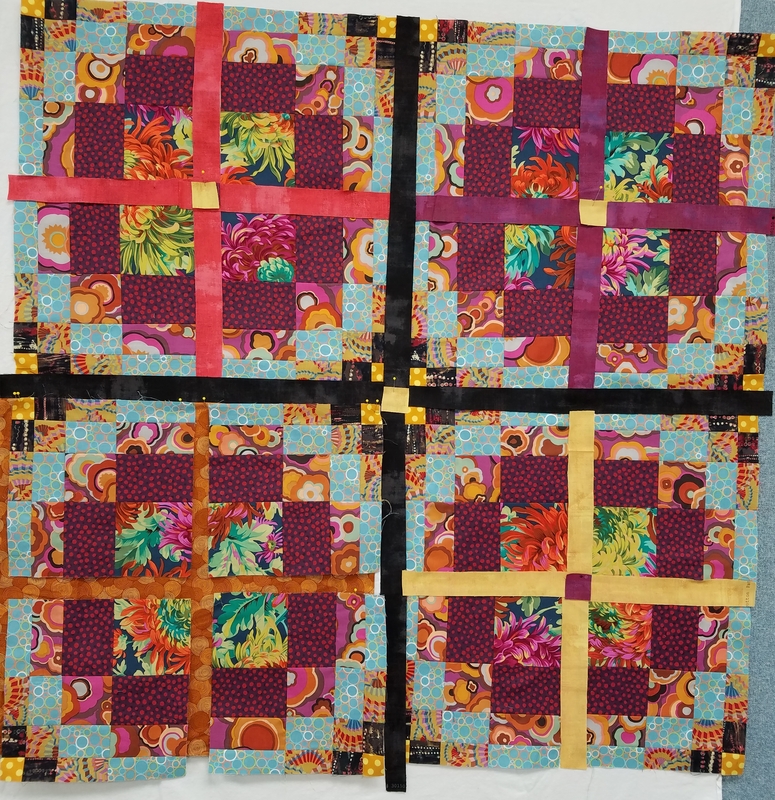 In all classes, it was such fun to see the variety of fabric choices and results. Visiting four quilt guilds made this trip logistically complex, but with careful planning and collaboration all went smoothly. As I was transferred between the groups, guild members took excellent care of me and made me feel welcome wherever I went. I taught five workshops and they were all different. 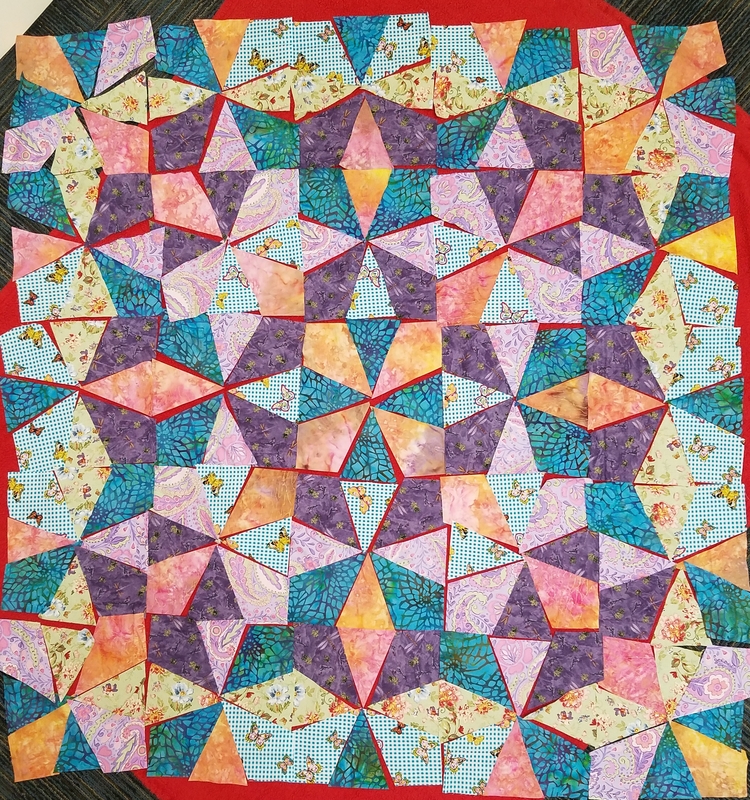 After packing the essentials of the quilts for my trunk shows and workshop materials in two suitcases and my hand-luggage, I only had 12 lbs left for two weeks’ worth of personal effects. Both suitcases were within less than a pound of the maximum 50 lbs. 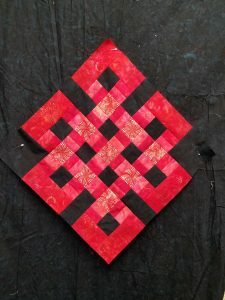 I sent five packages of books, patterns and Mongolian items for sale by mail in advance. 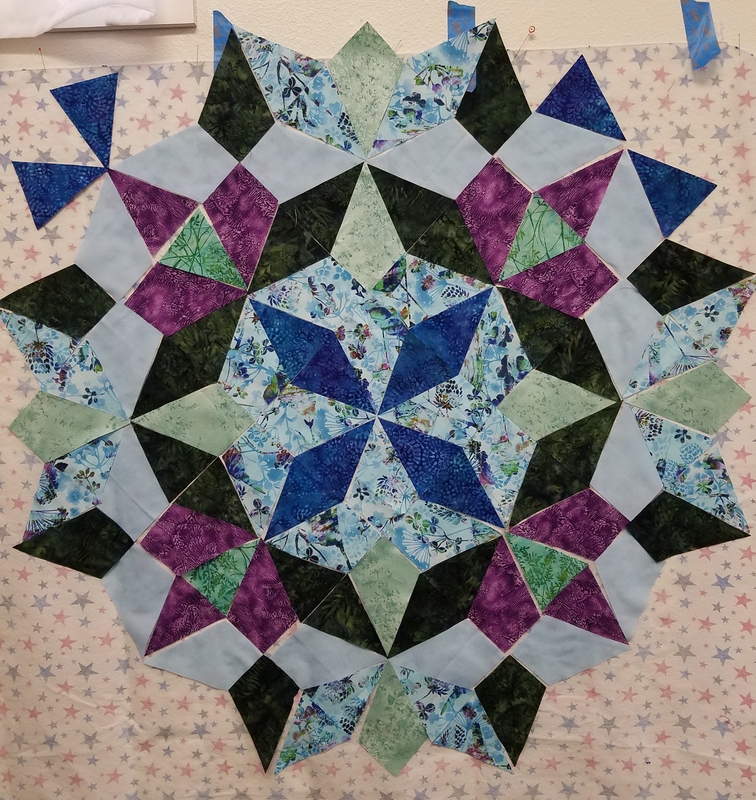 So, lots of stuff! 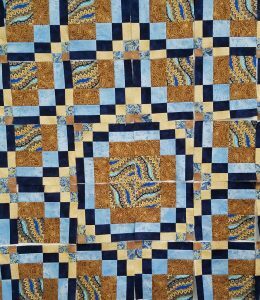 It’s always inspiring to see the work of other quilters and I enjoy the “Show and Tell” at the guild meetings. 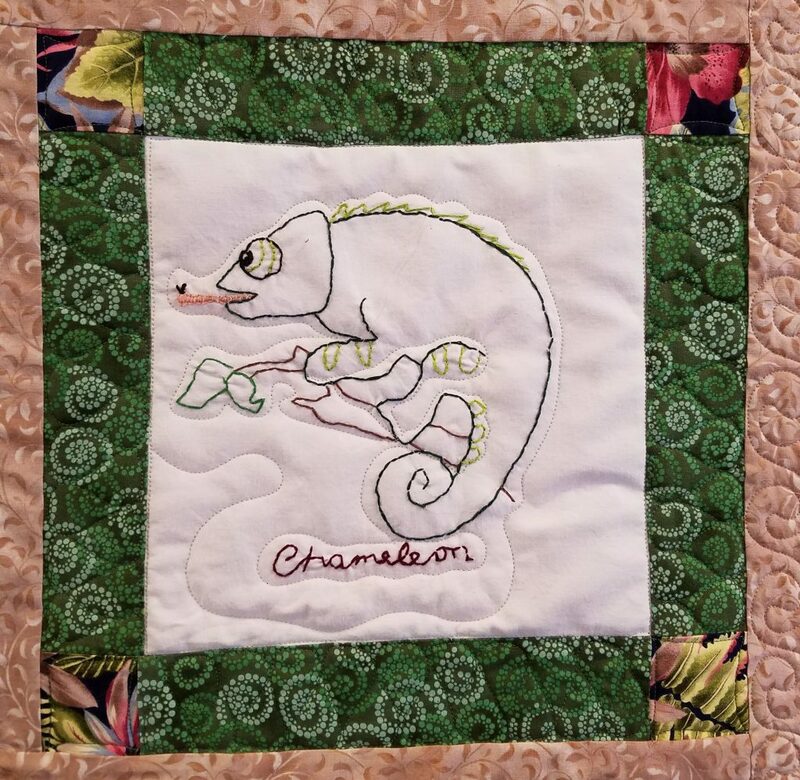 I’m blown away by the talent and also the generosity of quilters who support many philanthropic organizations with gifts of quilts stitched with love and care. 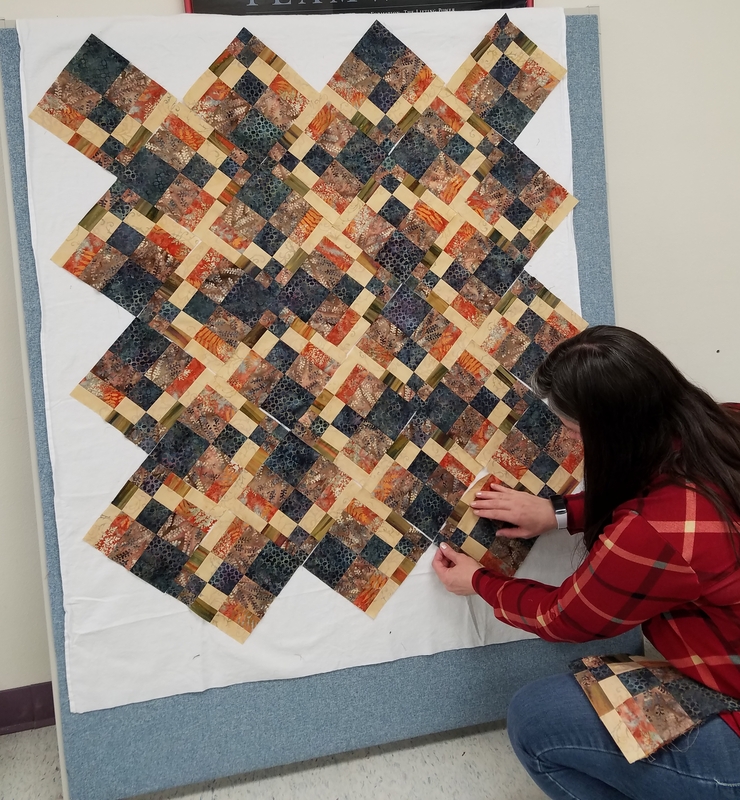 Guild members come together to make opportunity quilts as fundraisers for their guilds, the proceeds of which pay for education and the likes of me coming to lecture and teach. 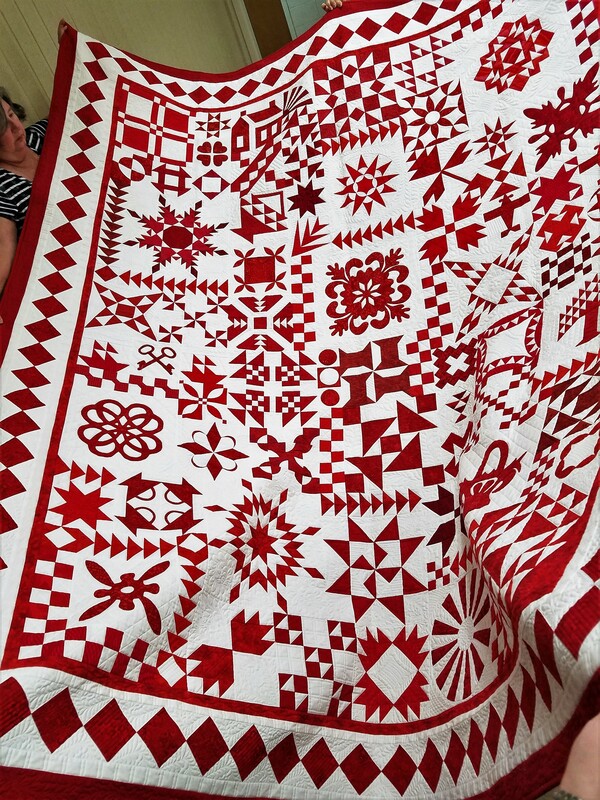 Here is the beautiful red and white raffle quilt made by the Hill Country Quilt Guild in Kerrville. The theme for their next quilt show, taking place on Memorial Day Weekend, is “A New Twist on an Old Favorite: Two Color Quilts” at which this quilt will be displayed. 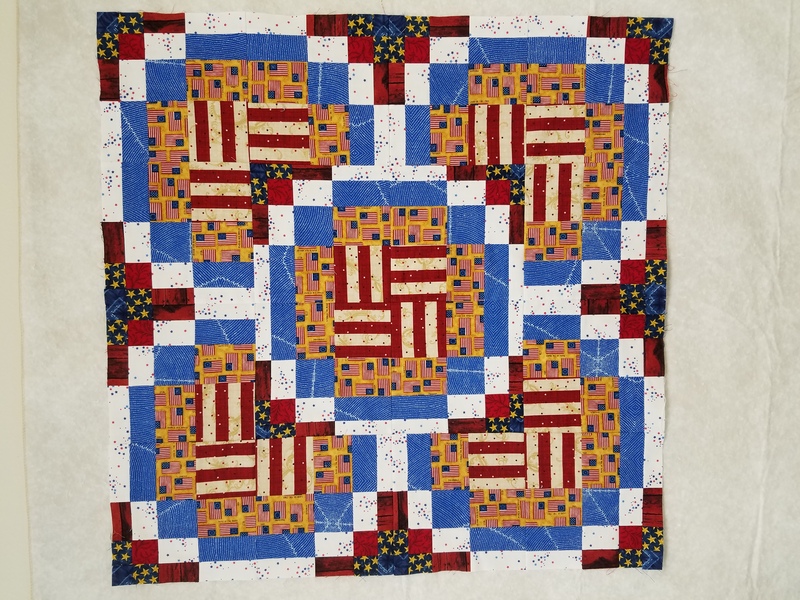 I am drawn to this traditional classic look and love this quilt. Talking of the generosity of quilters, I’d like to thank the members of the guilds of San Antonio, Bryan, Fredericksburg and Kerrville for their incredible support for the Mongolian Quilting Center. 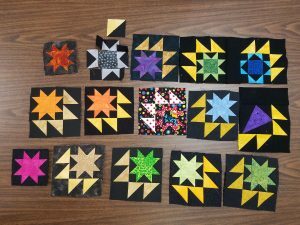 We raised a whopping $3,650!